Tivadar Kostka Chontvari was self-taught and did not master artistic skill. Yet this painter was able to create a masterpiece that amazes lovers of real art around the world. 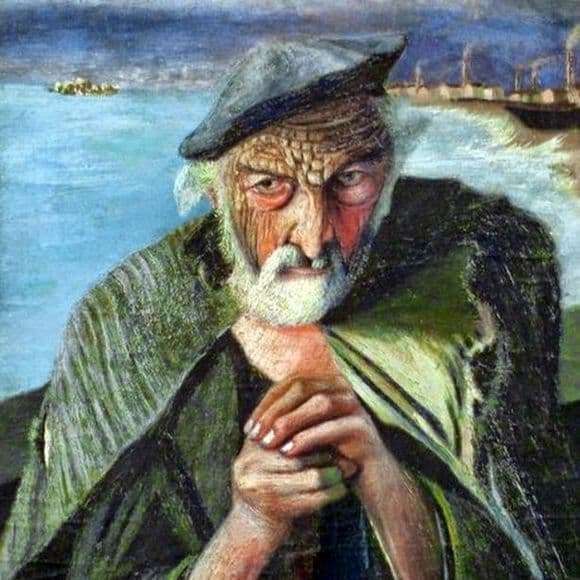 The work “Old Fisherman” is considered one of the strangest, her riddle was not immediately solved, and the mystery of the painting is simply amazing. The canvas is shrouded in all sorts of secrets and legends, many are afraid of it, someone can not hide the enthusiasm, but the picture is clearly conflicting feelings. The artist himself was not a success, and his work did not cause positive feedback. At first glance, nothing special about this picture. An old man with a strange face, behind his back the sea, part of the coast and towering mountains. The coastline is littered with houses, from the pipes of which smoke rises. This is evidence of life, the old man is not a hermit, he lives among people. On the one hand the sea is calm, and on the other – raging. The old man is dressed quite traditionally, perhaps only the headdress makes him look like an artist. The hero’s facial expression is scary, it twisted in a strange grimace. His skin is covered with scales, apparently the elder is always in the wind. Hands strained, and look tired. It can be said that this person bears the heavy burden of work and domestic problems. Through the gaze you can experience the vast life experience of a fisherman. And now, after nearly a century, the work of the Hungarian artist began again. 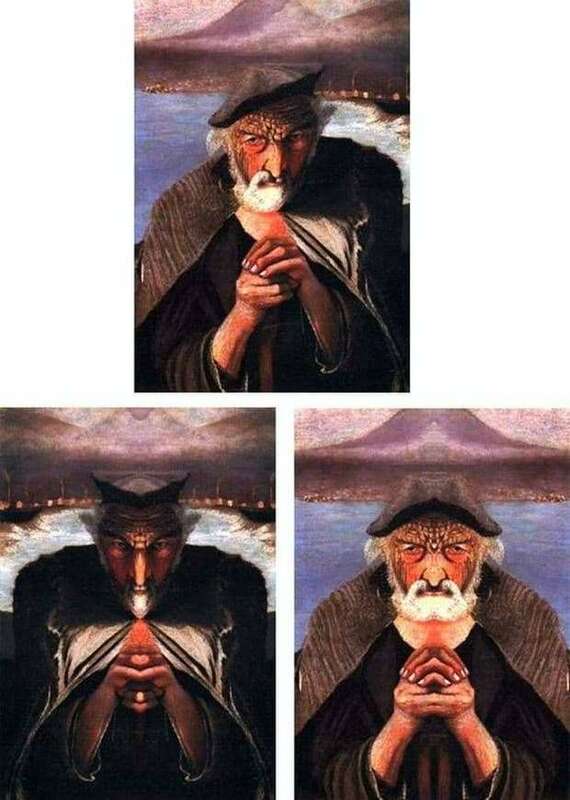 It turns out that if you put a mirror in the center of the picture, you can see two completely different images depending on which way the mirror will be directed. In one case, the image of God is obtained against the background of a calm water surface. In another case, the image of the Demon emerges against the backdrop of a raging sea. This effect was discovered by the museum worker and made a real revolution. The painter is considered a schizophrenic patient, but the attitude towards his work has changed completely.